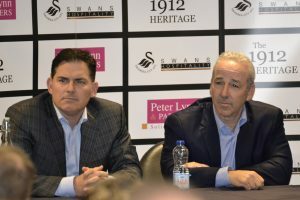 The Swansea City Supporters’ Trust has today released an audio recording of its Members only forum with Jason Levien and Steve Kaplan, which took place at the Liberty Stadium the night before the Swans heart-breaking defeat against Spurs. From what we understand, things did get a little heated when the more prickly questions around the club sale were put to the American owners. So it will be interesting to hear the forum in its entirety and the exact words spoken, rather than having to rely on the snippets released by both the BBC and Wales Online both during and after the event. Here is the audio recording, which has thankfully been put onto YouTube. We’d recommend you go and grab yourself a cuppa before listening though as it is almost an hour and 30 minutes long! Let us know what you think of what was said by both Levien and Kaplan using the comments box below.